SUMMER FIELD WORK SET TO BEGIN! We’ve been busy here at AltaRock preparing for additional testing of the EGS well, which is scheduled to begin the last week of August. We’ve been lining up contractors, cranes, well-bore evaluation equipment, and crew for the operations. Compared to our field activities last summer and fall, the field work planned for 2013 is short and sweet, but it is critical to keep the Newberry Volcano EGS Demonstration moving forward. We’ll connect pumps and pipe from the on-site water well to the deep geothermal well. Once the pumps are turned on, the rate at which the groundwater from the local aquifer can be injected into the well at moderate pressure will help us understand how much we improved the permeability of the zone which was stimulated last year. Although the pressure won’t be high enough to create any new permeability or generate microseismicity, we will continue to monitor our seismic network, just like we have been doing for the past year. Well logging refers to collecting data about the steel, cement and rock in a well by lowering an instrument or tool down the well bore. 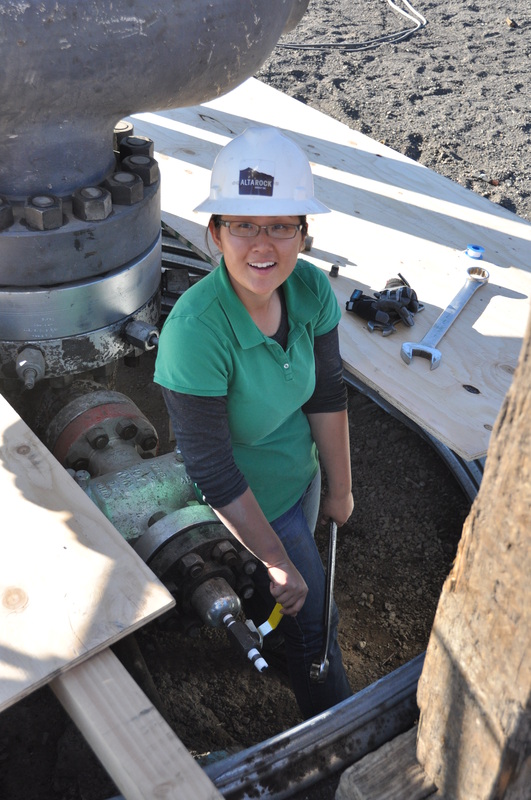 This summer we’ll be using a number of well logging tools to gather data on the well. For example, measuring the temperature of the water in the well will tell us whether the rock and water have warmed back up to the pre-stimulation temperatures or remain cooled due to the injected water. The logging data will be processed and used to inform decisions about future work plans at Newberry. As part of our on-going water monitoring plan, we continue to collect surface water and groundwater samples from nine different sites and have them analyzed for a variety of geochemical constituents. Maintaining the water quality of the local aquifer is important to the EGS Demonstration, and also to the public. To date, we’ve analyzed over 40 samples and no significant changes have been found at any of the sites we monitor. As part of the monitoring plan, the Bureau of Land Management has also collected duplicates of several samples and sent them for analysis as well in order to confirm our results. Our previous blog post ‘Groundwater Monitoring: What’s Winter Field Work Like?’ gives more specifics about the process. EGS stimulation can be deployed at shallower depths. It is just a matter of whether the temperature is high enough to be economical. At 10000 ft (3 km), 55-29 is >600 F (315 C). I am sure there are places in the Andes that have high temperatures shallow where EGS would work. By the way, back in the 1990’s I worked in Andes of Argentina (Salta and Jujuy provinces). I’d love to come down again and help to get geothermal going down there! Dear Trenton. Thanks for answering. I want to say sorry cause my bad english. I work in the S&T National Agency and I’d realy like you could come here to visit. Have you visit Buenos Aires? A very interesting project, and the blog too. I will keep reading the news. For what i understood, you are drilling next to an extint vulcano. Am I right? So you are trying to prove that you can generate geothermal energy (15Mw power) in places without geysers. But, there is, in both cases, an common fact: magma nearby. So if i don’t have magma nearby (recent volcanic history) i cannot apply your technology, right? Or maybe i can, but i will have to drill till reach the >300ºC temperature. And the more i drill, the rock pressure grows, and maybe, the technology that you use to crack the rock doesn’t apply? For example, i’m from Portugal. We do have a geothermal plant at Azores Island, but works with the steam, that they capture at 500meters depth. But at the mainland we don’t have volcanic history. We do have seismic history, and some identified geological failures. Some failures have nearby hot water springs (35 to 70ºC). Would your technology works in this cases? You don’t need magma nearby for EGS, just hot rocks. EGS projects are ongoing in the Cooper Basin of Australia and the Rhine Graben in France and Germany. Those areas do not have nearby magma, but old granites with sufficient radioactive decay to generate heat and thermal blankets of deep sedimentary basins to keep the heat in. Also, EGS doesn’t need 300 C, 200 C rock is probably economic. A 4-5 km deep well can reach sufficient temperatures for EGS in many parts of the world, and the same technologies that we are developing can be used at those depths. A 70 C hot spring may indicate sufficient hot rock at depth to try EGS. We do have granite and slate too, but i don’t know how easy is to drill this kind of rock at such a huge depth, and “frackling” it with such tension and hardness… uhm.. not easy. But lets talk about your project. For what i read you have stopped drilling at 2km depth. Right? For your distance to the extint vulcano, i assume that the majority of the rock that you removed was basalt? Sorry teh questions, but i’m curious.